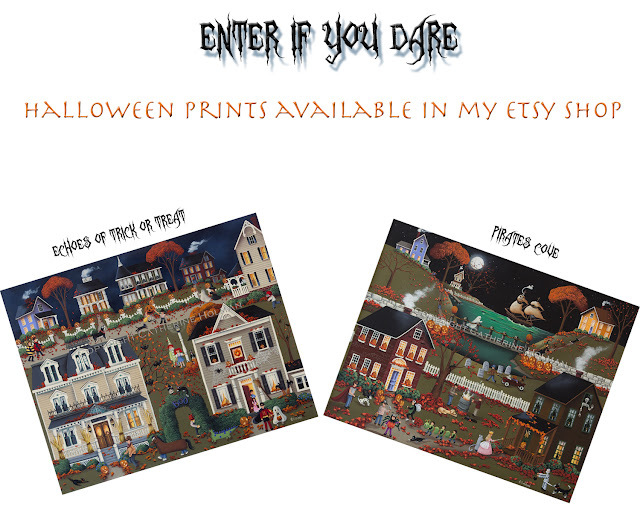 Stop by my Etsy shop to see my Halloween prints! I wish I had gotten my paint room finished sooner! I would have loved working on a new Halloween scene this year. Check out my Halloween cupcake prints too! I still cherish my Lavender Hill Studio painting from you! I love your art and these are exceptional! Enjoy your week sweet lady! Hugs! I am so incredibly thrilled! I just framed Pirates Cove to hang above my fireplace! It arrived on Thursday from Fine Art America and kicked me into gear to get my fall decor out :) It is a masterpiece of wonder and enchantment - - - my mom is completely envious and will be ordering prints soon, I'm sure! I also ordered Christmas at Fox Creek Village for when the season changes ... thank you for sharing your magical talents with us, Cathie! Adore your work! !